Cytogenetic Analysis: This is a hypotriploid human cell line. Both 61 and 62 chromosome numbers had the highest rate of occurrence in 30 metaphase counts.The rate of higher ploidies was 3%. The t(11q12q), del(11)(q23), 16q+, del(9)(p11), del(1)(p32) and 6 other marker chromosomes were found in most cells. The N13 was usually absent. The Y chromosome is abnormal through translocation to an unidentified chromosomal segment. The X chromosome was present in single copy. Comments: The line is not detectably hormone sensitive, is only weakly positive for acid phosphatase and isolated cells form colonies in soft agar. 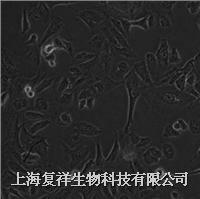 The cells do not express prostate antigen. Ultrastructural analyses of both the cell line and original tumor revealed microvilli, tonofilaments, desmosomes, any mitochondria, well developed Golgi and heterogenous lysosomes.